But we know better, don’t we? And his Elves keep busy year-round, too. Take Millie, for instance. She is over by the former Betsy Ross Doll House in Holiday World. Former? That’s right. The doll house is moving out of the park! Don’t worry, though, it’s just heading down the road a bit. 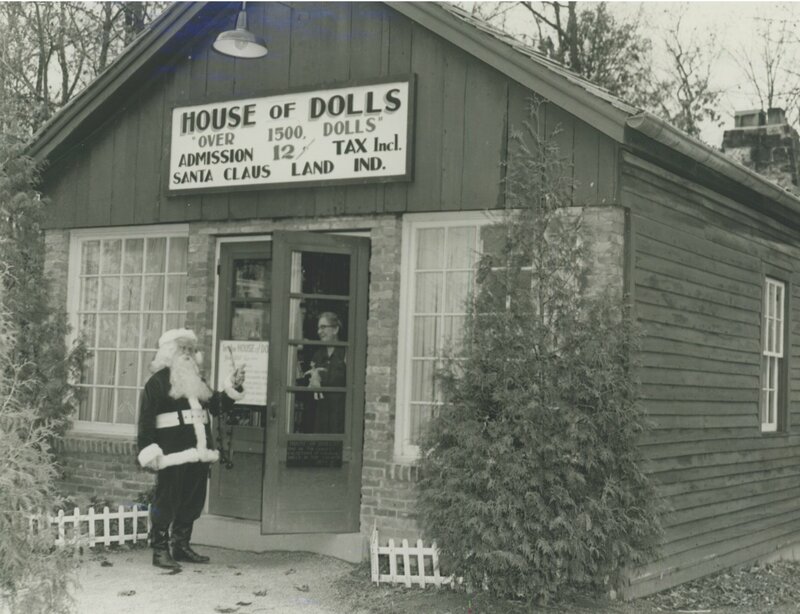 Did you know the Doll House had an entirely different life before being moved to the park in 1946? That sweet little building was the original Santa Claus Post Office, which opened in 1856. 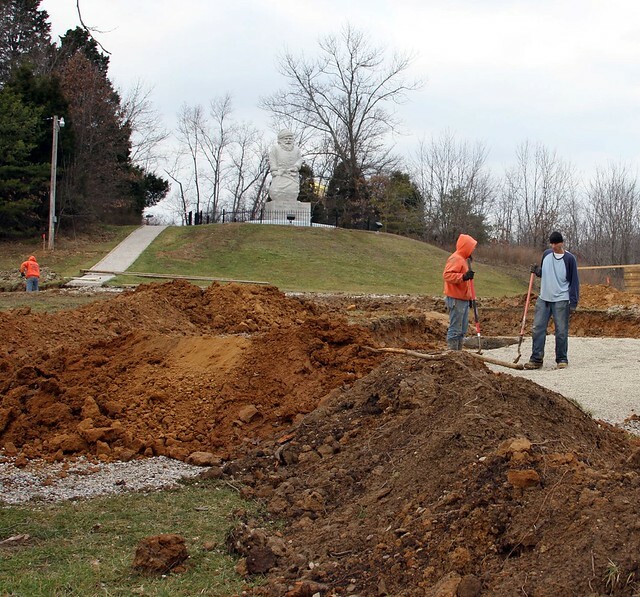 After 65 years in Santa Claus Land (as the House of Dolls) and Holiday World’s 4th of July section, the post office will be moved soon to join the historic Santa Claus statue around the bend on State Road 245. 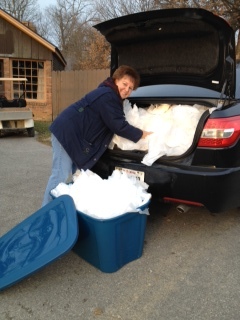 Back to Millie – she’s packing up the hundreds of dolls for safe-keeping. 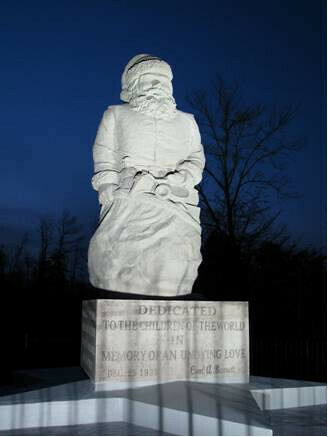 Here’s the 1935 Santa Statue, which we restored last year. Isn’t it lovely? It practically glows at night. The Santa Claus Museum moved a portion of its collection into the green building next to the statue in time for Christmas visits last year. This is where the Santa Elves performed their letter-answering duties, too. Museum founder Pat Koch has long dreamed of creating a village with some of the town’s historic buildings, and the next step will happen very soon. Two iconic buildings will join the Santa Statue and Santa Claus Museum in the coming days. 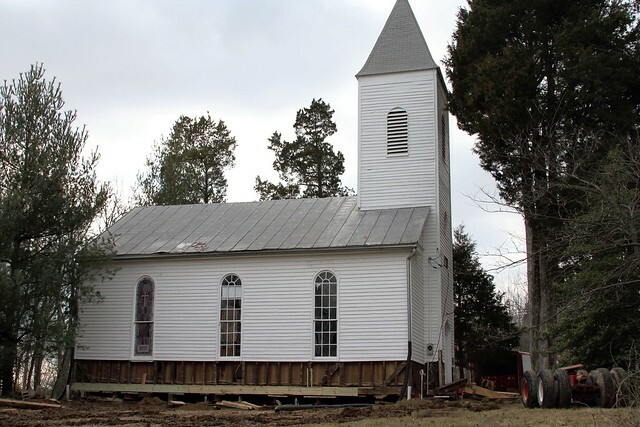 Here’s where the church and the original post office will be moved to in the next week or so. Although we’ve had a mild winter so far, it’s not easy to plan a move of this magnitude this time of year. But we’ll be sure to keep you posted! Meanwhile, watch for updates on our Facebook page and Twitter feed. My favorite Mattel toy is the Power Wheels cars. My girddchalnren will play with them all day driving around the yard. Plus it teaches them how to steer, accelerate, and shift gears.